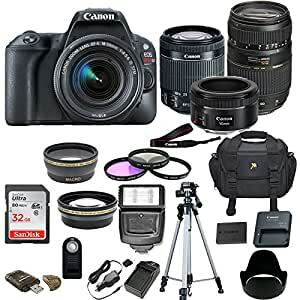 This Canon SL 2 Camera Bundle Kit comes complete with all manufacturer supplied accessories with 1-year Canon USA warranty and includes: Canon EOS SL 2 – 24.2MP APS-C CMOS sensor and a DIGIC 7 Image Processor -native sensitivities up to ISO 25600 and extended sensitivities up to ISO 51200. The SL2 also manages some significant body upgrades, with the main addition being a 3.0″ vari-angle touch screen LCD for intuitive operation and the ability to work at odd angles with relative ease. Canon EF-S 18-55mm f/4-5.6 IS STM Lens with – EF-S Mount lens which provides optical Image Stabilization up to 4 stops of correction against camera shake with clearer images, even in dim light. A high-precision aspherical element reduces chromatic aberration throughout the zoom range for high resolution and contrast. Canon EF 50mm f/1.8 STM Lens â EF Mount Lens which comes with a maximum magnification of 0.21x ideal for action, portraits and dark light photography. Utilizing an STM stepping motor, this lens is ideal for both still and video shooting due to its speedy and smooth operation. Further benefitting video shooters, the STM motor also supports the Movie Servo AF mode on select DSLRs for precise and near-silent focusing. Introducing, Tamron 70-300mm LD Di f/4-5.6 Macro Autofocus Lens which compliments this Canon bundle with more responsive and quieter auto focus. This lens delivers ultimate handling ease and portability in the field due to its lightweight size and mechanical operation. Best suited for shooting outdoors to make full use of the real telephoto of 300mm as well as providing diversity in portraiture using the medium focal length ranges of 70mm to 135mm. In addition the bundle includes Commander 0.43x Super Wide Angle Aux, Commander 2.2x Aux Telephoto lens Canon Battery, Canon Battery Charger, Camera Case, 50inch tripod, Canon original strap, Electronic Slave Flash, Extra AC/DC car/home worldwide battery charger (Replacement), SanDisk 32GB Ultra Class 10 SDHC UHS-I Memory Card, 3 Pcs Commander filter kit, Commander wireless remote, Commander memory card reader and more.